Assassin’s Creed Odyssey is the most popular game in the series to date. The game’s concurrent player count hit a peak of over 62,000 on Sunday, making it far more successful than any of its more recent predecessors. To put Odyssey’s success in greater context, its peak is 33% higher than what Origins managed last year – the series’ journey to Egypt racked up 41,000 concurrent players on Steam at its peak. That in itself, however, was far more than the series’ previous outings had managed. Black Flag came in pretty strong, with a concurrent peak of about 16,000, with Assassin’s Creed 3 a little further behind on just under 15,000. The figures for Odyssey and Origins come from Githyp (via VG247), but they place them alongside some of the series’ most recent other outings, which make for pretty disastrous reading. Githyp claims that Assassin’s Creed Unity limped to a peak of 5,400 concurrent players, while London-set Syndicate managed only 3,600. That’s about as popular as Assassin’s Creed 2, which has an all-time peak of 3,582 players according to Steamcharts. It would seem, then, that the two-year break between Syndicate and Origins did the series a world of good – which means the fact that there won’t be a new Assassin’s Creed in 2019 would seem to bode pretty well. As for what that might be, my money’s on feudal Japan. 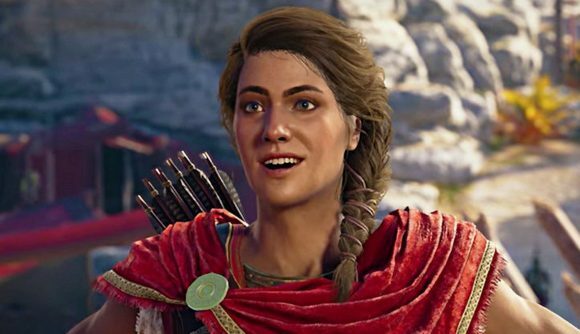 While concurrent players are high, Assassin’s Creed Odyssey sales are actually down on Origins – UK physical charts say that the Greek offering shifted 26% fewer copies than its older brother. There are a lot of factors likely contributing to that figure – the decline of physical sales among them – but it’s an interesting juxtaposition nonetheless. If you’re yet to pick up Alexios or Kassandra’s adventure, check out our Assassin’s Creed Odyssey PC review. Otherwise, take a look at our Assassin’s Creed Odyssey tips. We’ve got advice on everything from ship combat to levelling, and we’ll even teach you how to acquire your own furry friend.